MOMMY&ME: [VIDEO] THE SUPER EASY WAY I GET MY TODDLER TO EAT&ENJOY FRUITS & VEGGIES EVERYDAY! — All Eyes on Jordy C.
Here is a video of me making the "GREEN SMOOTHIE" with two of Little P's cousins!! How do you get your baby to eat healthy foods, fruits and veggies? Food itself is actually a pretty sensitive “thing” in my household. Unlike any of my family or friends, my son has several SEVERE food allergies. This has been one of the most challenging parts of my motherhood experience, since I’ve never known anyone with them and knew nothing about them prior to my sons birth. I don’t want to digress too much so I will get more into that in a future post. Since my toddler is allergic to so many foods, it’s extremely hard to get him to eat healthy foods that he’s not allergic to and that he actually enjoys! Whether it’s nasty veggies or healthy fruits that kids don’t particularly care for..All moms know how challenging it is to get their little ones to eat well! My son for example hates pretty much all green veggies...that doesn’t mean he gets away with not eating them though lol..I’ve actually found a way to get him to eat them EVERYDAY without him even realizing it! I’ve created several different smoothies..one being a blended green concoction that in my house we refer to as the “Green Monster.” This particular smoothie is stacked with lots of superfoods and fruits that if you make this at home..your little one will soon unknowingly have a love for! 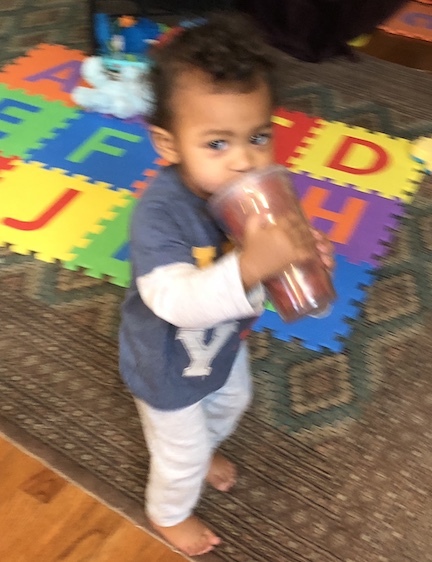 Here are some photos of my little Prince over the months (obviously not years haha) enjoying some of Mama's different delicious Fruit & Veggie Smoothie concoctions! "The Green Machine Smoothie"...inspired by Odawalla's bottled superfood smoothie.